The hype surrounding I Was Bono’s Doppleganger by Neil McCormick is no surprise. With remarkable anecdotes about U2’s earliest days, it is essential reading for any U2 fan and a fascinating account of making it (or not) in the music business. Moreover, it shines out as one of the most candid memoirs one could hope to read–an incisive meditation on the lure of fame. U2log.com’s Jack A was lucky enough to visit the doppelg䮧er in his London lair and get the inside line. 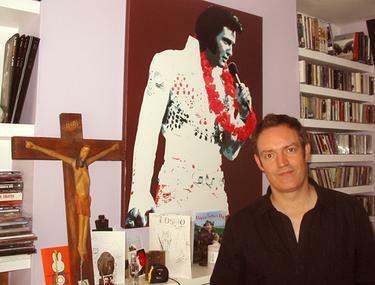 I had the pleasure to meet Neil McCormick on a warm, weekday morning at his home in North London. I envisioned meeting a man in dark glasses and a tight leather suit wielding a large remote control. It turned out that Bono’s doppelg䮧er is on the surface a very regular man. I had greatly enjoyed his book and was itching to follow up on some of the questions that it raises, as well as touch on issues I’d always wanted to ask as a U2 fan. This might have been rather annoying–particularly in between back-to-back interviews with TV, radio, and the press–yet from the word go, my subject was articulate, effusive, and generous with his replies. I left with a reinforced sense that U2 are lucky to have such a friend. If anyone’s going to dish the dirt, it should be Neil McCormick. The way Bono is quoted in the book makes him comes across as constantly, exclusively, reflective and wise. Is Bono really like this? You know, Bono is like that. I don’t think I have ever heard him say something trivial. That’s a funny thing. In some ways, he has come across as the Buddha or something. I think that’s a bit of an exaggeration. He’s not the fount of all earthly wisdom, but he is really entertaining company. He thinks before he speaks; he doesn’t just blab. He thinks deeply about things and lives life to the full, and that’s reflected in the way he speaks. How were you able to quote Bono directly and accurately? I documented our conversations because I realised that Bono has an incredible take on things. He thinks about pop music, and he knows everybody. And so you say, “I saw Pavarotti last night.” Well, the first think he’ll do is say, “I saw Pavarotti this morning–for breakfast.” But after that, he’ll talk about Pavarotti in a really enlightening way. How does one go about writing a memoir properly? You have to be honest. There were times, of course, when I was tempted to improve a scene and put myself in better light. The problem with that is that falsehoods takes things awry. If you stack up falsehoods, you end up with a completely false book. It was a conscious decision to be truthful. I wanted to write a book that read well, whether you cared about Bono or whether you cared about music. I wanted it to be something good. I wanted every paragraph to have something in it that might entertain or amuse. Was it difficult to confess that you began to dream of Bono? Sharing my dreams was probably the most embarrassing part of all. Bono did become to haunt my dreams. Someone said to me, “This book is like a love letter to Bono.” That’s a slightly embarrassing aspect of it, though I do think very highly of him. There was a time when I was feeling quite bad about my own self, when he really started invading my dreams. I woke feeling embarrassed. I thought, Am I so crazy for the approval of this man that he is in my dreams, or am I so envious for what he has achieved? Am I that shallow? You can’t control your dreams. In fact, the dreams stopped with the writing of the book. If he wanders into my dream now, he doesn’t wander in as this dark god of everything I never attained. He might be in my dream in the same way that my next-door neighbour might be in my dream. What was your logic behind writing the book? I had an idea. In these secular times, people still reach out for the kind of archetypal figures who used to belong to myth and then belonged to religion–people who give us an idea of how we can be as human beings. I think the archetypes of our age are the famous, and so the truly famous people are like the saints of yore or the gods of mythology. Bono is about as big a rock god as you can find. He’s attained the status of the John Lennons and Bob Dylans. He’s come to represent something in the psyche of Western culture. It was my misfortune to have gone to school with God. You witnessed U2 form. Did they ever doubt their ability to succeed at the beginning? They had great confidence in each other and great loyalty, which stood them in great stead. In the bands that I had, we had no loyalty and when someone wasn’t up to it, they left or got booted out and somebody else replaced them. Success isn’t pre-destined. It often looks that way retrospectively. People start to believe it, and possibly even the members of U2 believe it. I believed it was my destiny too, but I learned otherwise. They never learned otherwise; they dreamed of something and they got it. It is often suggested that U2 have had to be ruthless to get to where they are. Are they ruthless? There was obviously a degree of ruthlessness right at the start when Adam dispensed with the services of my brother Ivan, lying blatantly by telling him that they had a pub gig and that he wasn’t old enough to get in. Clearly, they didn’t have a pub gig because they didn’t have any songs to play at a pub gig. The first gig they did they only had two songs, and one of them was the Bay City Rollers. I would say it is characteristic of U2’s rise that they have been incredibly kind to people and incredibly inclusive to people. Bono is very gracious to the people around him. He doesn’t give a person status according to their status in the world. He recognises people for what they are. That graciousness imbues them. I don’t think the nasty side lurks. People fish around for it, but I don’t see it. In the book, you portray Lypton Village as being slightly unbearable. Were they? Lypton Village is the club you wished you had when you were a kid. They were a very interesting bunch of characters. They were deliberately provocative. They were all maybe a year older than I was, and that can carry a lot of intimidation at that age. I hung around with a refusal to be intimidated, but inside they certainly intimidated me with the guerrilla art tactics they were making up for themselves. They were really a big part of Bono’s creative life. Guggi and Gavin Friday have influenced him a lot throughout life. They have a lot of ideas about things, and Bono is a man of ideas. He is constantly talking to them. Gavin is probably as close as you get to him ever. Is Bono the genius of the band? The great musician in U2 is the Edge. Bono is a musical force and has a lot of musical ideas, but the musical genius of U2 is the Edge. He’s not been given the credit he deserves because he’s outweighted by this primal force of Bono’s personality. There’s a running joke about Adam Clayton’s bass playing ability in your book. Will Adam be amused? I don’t think he has read the book. Adam is a very kind and humble man, in his later incarnations especially. He is a true gentleman. I think he’d be amused. I’ve told him some of the stories in it, and he just sat there and laughed. I hope I’m not being unkind to him, because his musical bluff is part of the U2 story. It’s kind of been recognised, and he’s kind of recognised it himself. That’s where U2 become greater than the sum of their parts, because he was not technically accomplished initially and yet his bass playing is a huge part of the U2 sound. In an early article in Hot Press, you ‘outed’ U2 as Christians. How big an effect did that have on the band? I think it had a massive effect, but I don’t think they could have kept a lid on that for very long. I think I was right to do it at that moment in time because somebody else would have done it in a hostile fashion. And probably quite soon. I think it had a massive effect because if you look at the difference between Boy and October, [it’s clear] October is a religious album. It kind of released them from pretending that this wasn’t their big concern and allowed them to express that. The album is a great album of big songs. It refers back to practically every period of U2’s musical history and yet it sounds like a cohesive album. It’s not dissimilar to All That You Can’t Leave Behind in terms of the fact that there are some very structured songs in there. It’s got more flow, it’s got more guitars, and it just hangs together that little bit better. It’s a great album. Do U2 struggle to have things to say now? The struggle for U2 is to maintain relevance. To keep achieving the things that they want to do–not just artistically, but politically–they need to maintain that status. That’s quite a big pressure to put on yourself, so the songs have to be big songs about big themes. They have to have interesting ideas in them. They also have to be inspirational. They can’t sit down and make a quiet, intimate album. That is their choice. It might be their loss, artistically. You don’t get U2 Blood On The Tracks or the acoustic sessions; you get the big album every time. There is nobody else at that level in the world trying to do that, so thank God for them! What do you hope readers will gleam about Bono and the band from your book? U2 are four very intelligent, very passionate, very driven people. At the centre of that four is Bono. He’s an incredibly intelligent, passionate, and driven person–possibly more driven than anyone else I know. In my book, I write about the difference between someone who achieves success and someone who doesn’t. Is the difference in them or is the difference in how the public perceives them? Ultimately, the public chooses who it is going to deify. One of the revelations, if it could be called that, is this kind of dark hole at the centre of stardom–the fact that Bono lost his mother, that fact that he didn’t get the love he needed from his father, the fact that there’s something in him that needs to find expression by getting the love of the world, because he hasn’t got it in his psyche from his youth. That’s not a very nice combination of factors, but it’s a very powerfully driving factor. And so, Bono wants that, he seems to need it, and he’s got the personality to meet it head on. What kind of rock star would you have been? It would have very much depended on what level I was at when I achieved success. Artistically, my aspirations were very high, but I was also into the paraphernalia of stardom. I was also full of myself. The danger would have been that my ego would have got out of all proportion to reality. But you wouldn’t have become unpleasant? I possibly was as it was, so who knows? But later on when you’ve struggled a bit, you’ve learned a few life lessons and maybe become a different person. Success feeds your self-confidence. I wanted the chance to have a fully creative life. I feel there are songs that have been lost and wasted. I’m 43 and am just putting out an album [as The Ghost Who Walks]. I’m putting 12 songs on it, and there could have been 200, which have been lost in the ether. There were other songs that were never written–the babies that never were born because I’ve had to do other things. Fame can imprison you, success can narrow you, and it does that for a huge number of people. Bono is someone whom fame and success have built and so he’s become a larger-than-life person. He’s really made a difference in the world. One hopes that one would have gone down that route. Probably with friends like Bono, I would have had to have gone down that route because I would have been told in no uncertain terms if I was going wrong. So, the book’s real goal is…? To get that man out of my head.